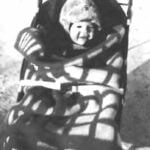 The time comes, children leave the parental home and, as often happens, the “old” people begin to associate their hopes with their grandchildren, often wanting to hear their voices. 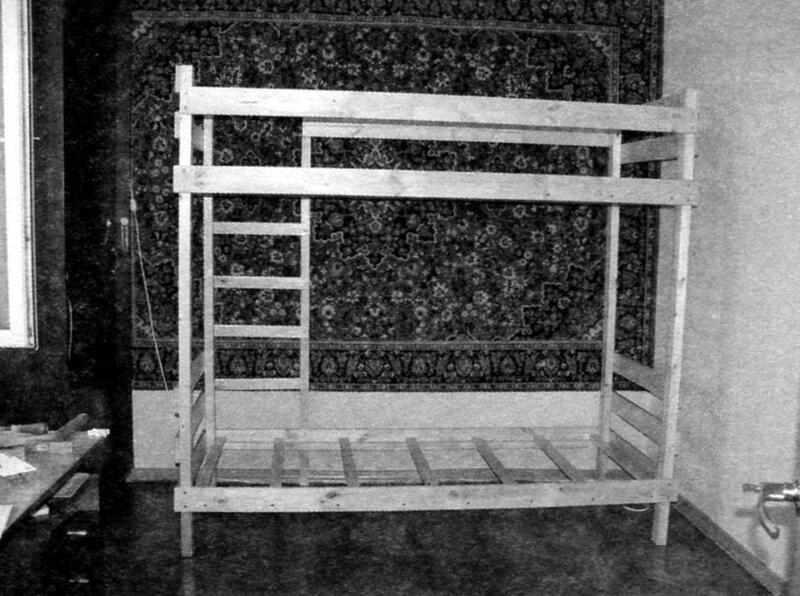 Was no exception and the author decided to realize their old dream – to put in the children’s room with bunk beds. 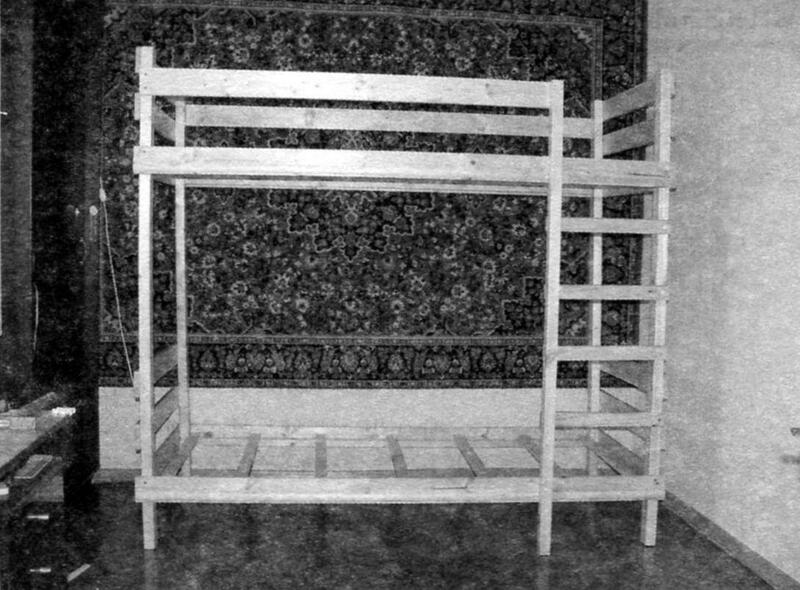 It is not only beds, but also a small gym with a ladder. It seemed easier to buy such a product in the store, but in this case there was a possibility that with age, about it will quickly be forgotten. And if it is to do it yourself, and even involve the children, then the effect would be appropriate. The task was complicated only by the fact that I had to do everything in a city apartment, “on my knees”. And the time on the “construction” was given a little while was “Indian summer”. So I had to abandon the architectural frills and tricks of carpentry. On the foreground the simplicity of design and its manufacturability. As usual, it all started with sketches, and only then began to acquire lumber of pine. When choosing the width and length of the bed based on the size of the mattress: 1900×800 mm, that is followed to buy lumber with a small margin – a length of 2 m. the Most convenient way to do this was to serve as a trip to the store “Leroy Merlin” – it’s close and cheap. 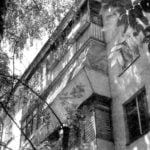 However, the hopes of the author on the store is not justified, since delivered out boards and timber were much shorter. The seller was ready to receive complaints, but this required to take in “Leroy…” all the goods, and it was not in my plans. The solution was found through the Internet, ordering mattresses custom size: 1800×800 mm. of Their length for the boys was enough. So that all who go to the store for lumber, I recommend you grab a tape measure. 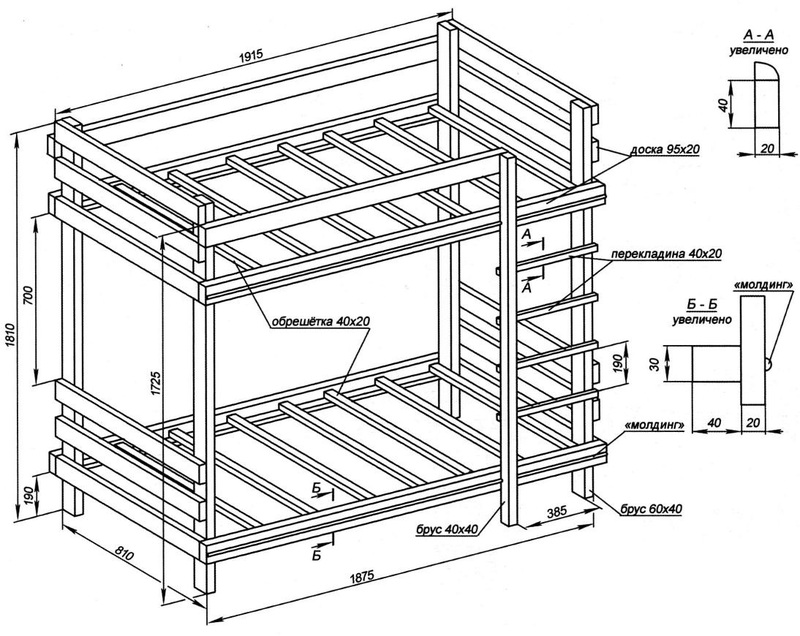 For the manufacture of bed need the beam: cross-section 60×40 mm (4 PCs. ), section 30×40 (4 PCs) and one – 40×40 mm, and also planed Board size 2000x95x20 mm (11 PCs.). In addition, acquired Reiki 2000x40x20 dimensions mm (8 PCs) – for crates and ladders. Later, when he assembled the bed frame, bought another Reiki semicircular cross-sectional dimensions 2500×20 mm (3 PCs.). Floor can use linoleum http://contractpol.com.ua/category/linoleum/which is a great coating for the room. Before Assembly, cut all lumber to the dimensions according to the sketch, and carefully handled them with sandpaper, thereby eliminating future sharp corners and splinters in children. In some places where knots had to use a small, personal file. All fasteners are made by screws (screws) and eurovento socket head cap screwdriver (the screws are the same, only with heads under a crosswise screw driver in the “Leroy Merlin” referred to as a furniture covering) length 50 mm and diameter of 6.3 mm. Evrovint easier under it easier to find decorative buttons. 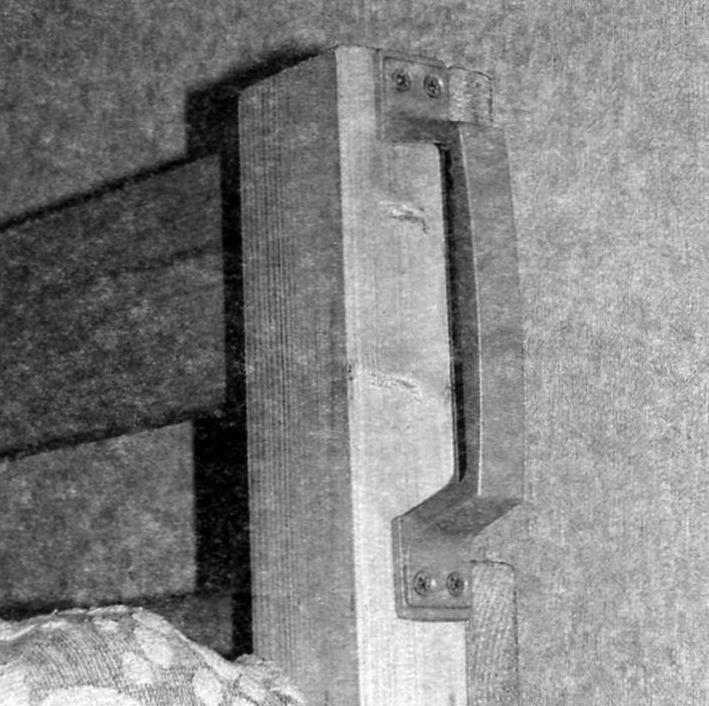 Bed manufacturer with started side frames, wherein, as mentioned above, declined from the architectural frills and all the connections were made in the pad as illustrated, pre-drilled holes with a thin drill under evrovinty in the boards. These holes later in the same drill made the markings in the vertical pillars (the beam cross-section 60×40 mm). It is desirable to do so, because it is possible later displacement of the holes from getting to the knots and to exclude them is impossible. First of all, did the crossmember, securing from the inside, planed boards block sizes 1815x40x30 mm, as shown in the photo and the drawing. 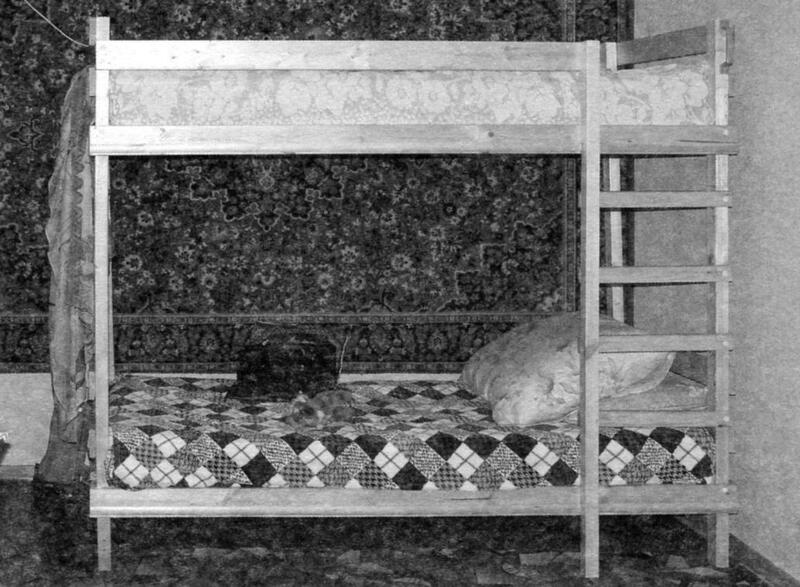 To these bars were later attached to the slats of the crates under the mattress. Then these cross members attached to the vertical support. Turned out two frames that are left to connect the sidewalls, and also planed boards dimensions mm. 810x95x20 However, for this I needed a helper to hold the side frame in a vertical position. When the frame is (in first approximation) has been stand steadily on the floor, began to increase in its rigidity. 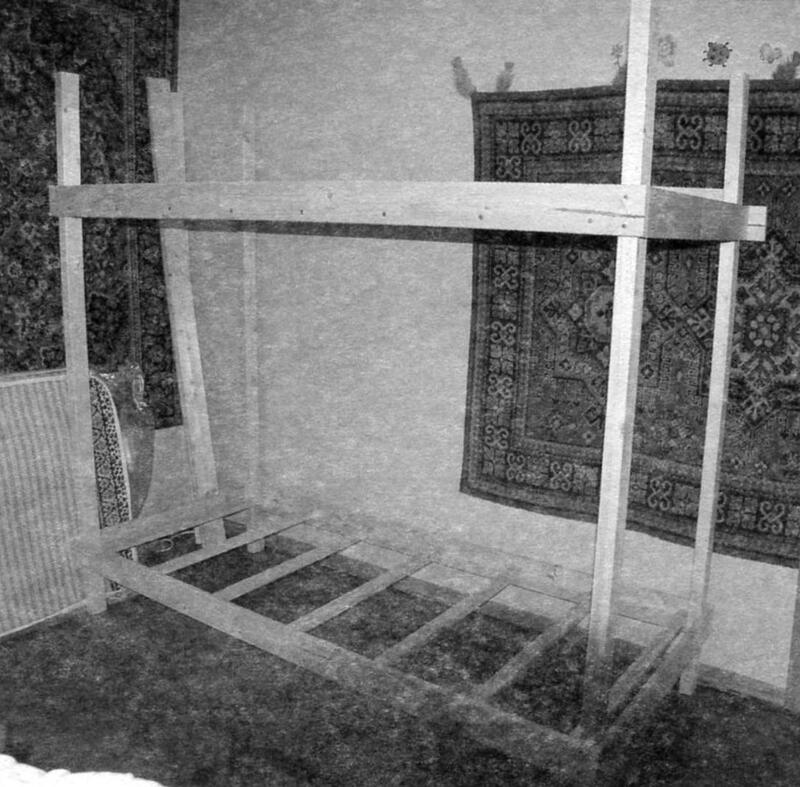 First, did the crates (top and bottom) under the mattresses, attaching screws with a length of 40 mm to the bars of the slats, the slats of the crates dimensions mm. 810x40x20 Then to the vertical supports using eurowindow attached additional sheets and cross section 810x95x20 1915x95x20 mm and mm, respectively. Left to do the ladder. Originally planned to make it a folding of the two bars section 40×40 mm and “Kruglyakov” (fragments of cuttings with a diameter of 20 – 25 mm, sold in stores) between them. Then attach the ladder by a hinge to the upper cross member, and below the lower cross member, – dusunceli. It would be easier for children, because the stairs would stand at an angle. But due to lack of time this idea had to be abandoned. Made easier. Evrovinty attached to the crossbars of the front side frame beam sizes 1725x40x40 mm. Then to him and the extreme vertical support -bar (bars with dimensions 465x40x20 mm). And that crossbar is not “cut” the feet, to the upper face nailed with finishing nails Reiki semicircular cross-section. 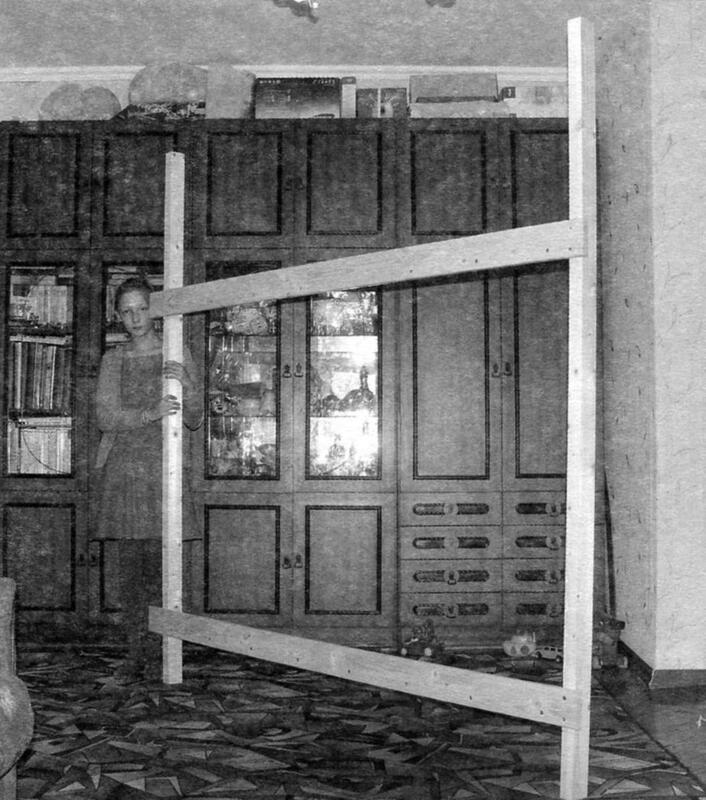 Since the width of the strips was 5 mm longer than the rungs of a ladder, then cut off her speakers of the longitudinal saw and carefully smoothed with sandpaper. Under the same rails hid head screws front cross members, and the rest of the cap covered plastic buttons. At the final stage of manufacturing beds, double-coated its frame lacquer under a pine tree. However, every man according to personal tastes and wishes of the children will be able to find the right solution. Moreover, the choice of paint coatings in the trading network today is quite extensive. Before laying the mattress on the crates put sheets of 3 mm hardboard. This is enough to not have failed springs. 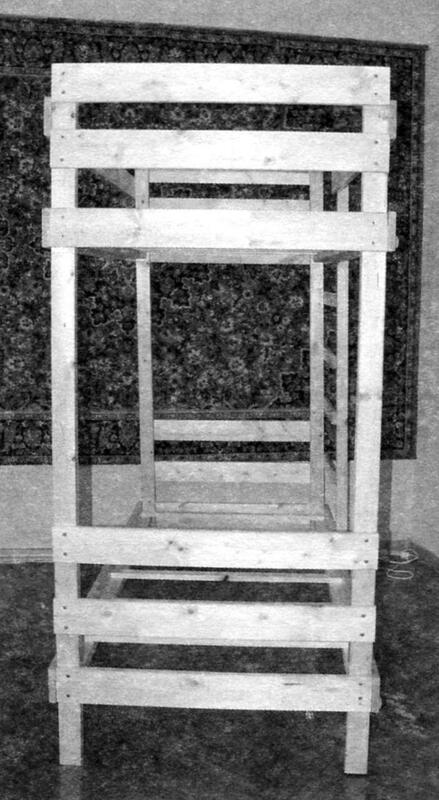 When the “operational” test bed revealed that the lower layer it is desirable to attach one side Board dimensions 1915x95x20 mm, to isolate the bed from the cold wall of the house and a pen (for convenience to get on the upper tier) on the upper end of the right (when viewed from the front) vertical support where the stairs are. 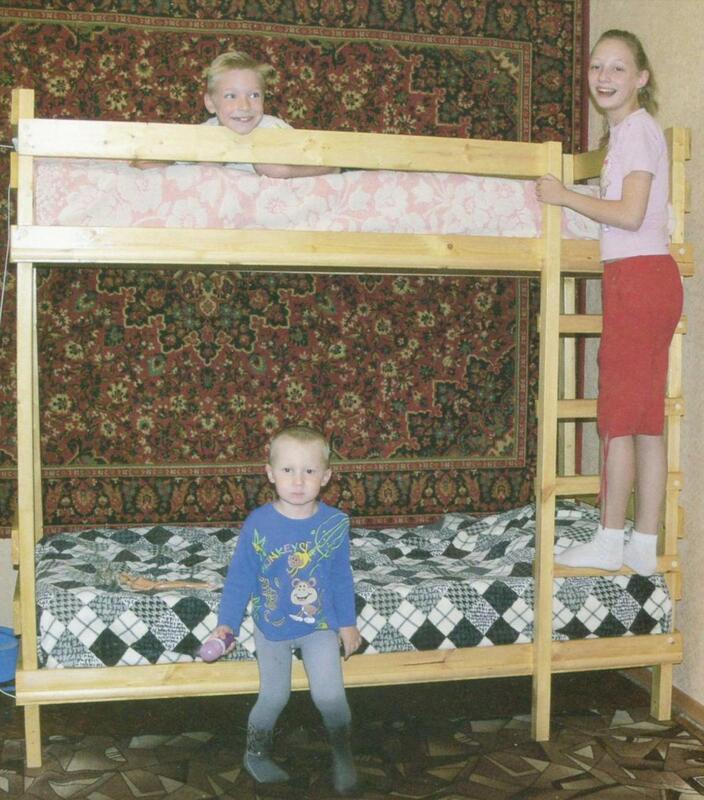 In conclusion, I will say that the bed is quite sturdy and, in the opinion of grandchildren, quite comfortable. Moreover, its manufacture has spent no more than 3000 rubles, while in the shopping network, they cost at least three times more expensive.